This picture is courtesy of pinpics site. 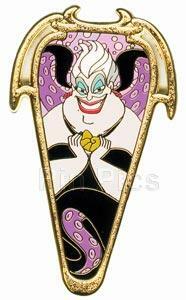 Outlined in a Nouveau-style gold frame subtly accented with wings and horns, the diabolical sea witch Ursula, from The Little Mermaid, lends her presence to this colorful gold-finished character pin, one in a series of pins showcasing notable Disney Villains. It's a Disney Auctions exclusive in a limited edition of 1,000 fixed-price pins, available only from Disney's Purchase It Now Store at DisneyAuctions.com. Ursula is holding a sea shell in her hands and the background is purple with octopus tentacles. This picture is courtesy of pinpics site.